Commuter motorcycles are generally considered simple without a striking design. Built solely for the purpose of city commuting, while ensuring a great mileage is delivered. 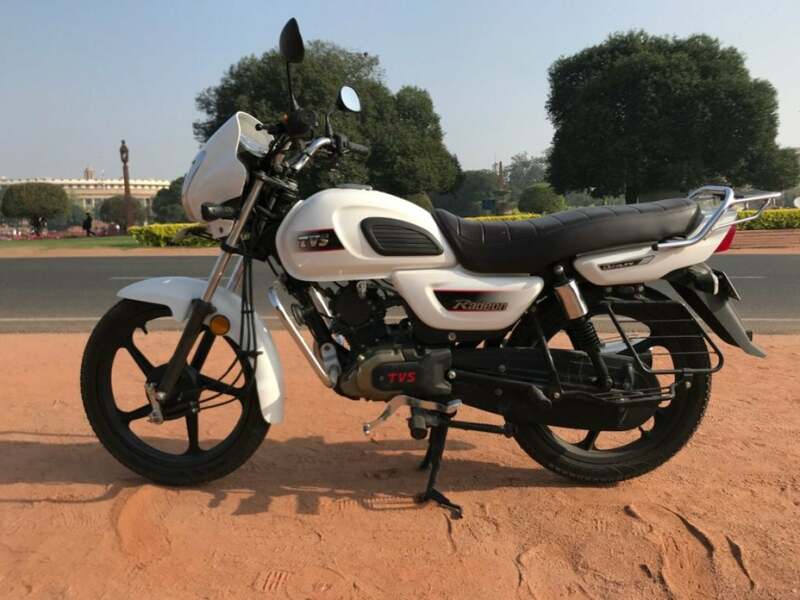 They are specially for the budget oriented, who wish to have a bike under Rs 60,000. As you know, most of the commuters look ‘Blah’, but here we have an exception. It came as a surprise to me when a regular budget motorcycle was turning heads. Seems like it is something new and premium for the budget buyers. Ofcourse, TVS has done this wonder of making a commuter look premium. TVS Radeon is a 110cc motorcycle which we saw was a right-on attraction for buyers preferring 100-110cc motorcycles. Actually, I had a lot of people asking about its price. Radeon was launched back in August 2018, immediately garnering a good demand in the market. 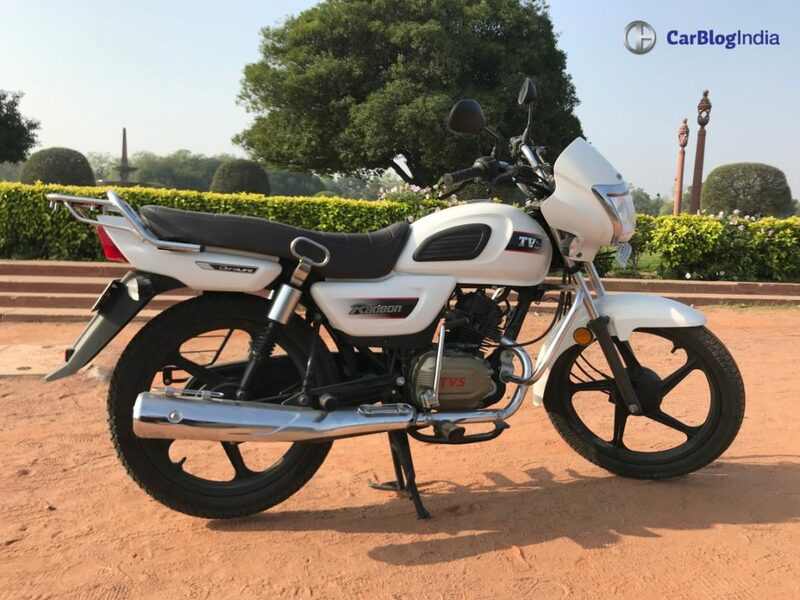 Yes, we know that Splendor is still the best selling, but it’s a bike which is trusted over decades and people buy without thinking about a second option. So, we have tested the TVS commuter during our usual daily routine. Continue ahead for a detailed review of its performance, handling, comfort and more. TVS Radeon adapts the typical commuter design, which feels outdated. 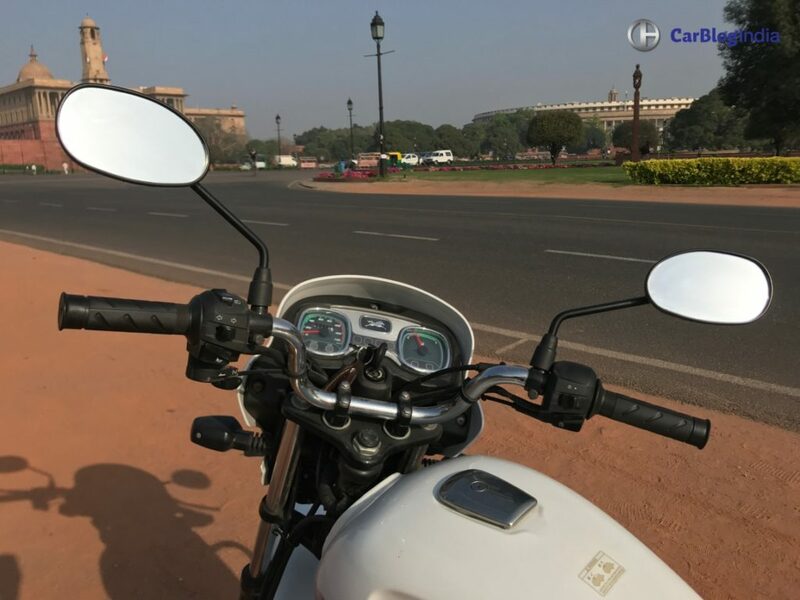 The headlamp cowl style, fuel tank design and the rear portion is seen on many other bikes in its segment. But, still, it looks much premium to them. There’s not much to talk about the styling of the bike, but we can certainly tell you about its design highlights. 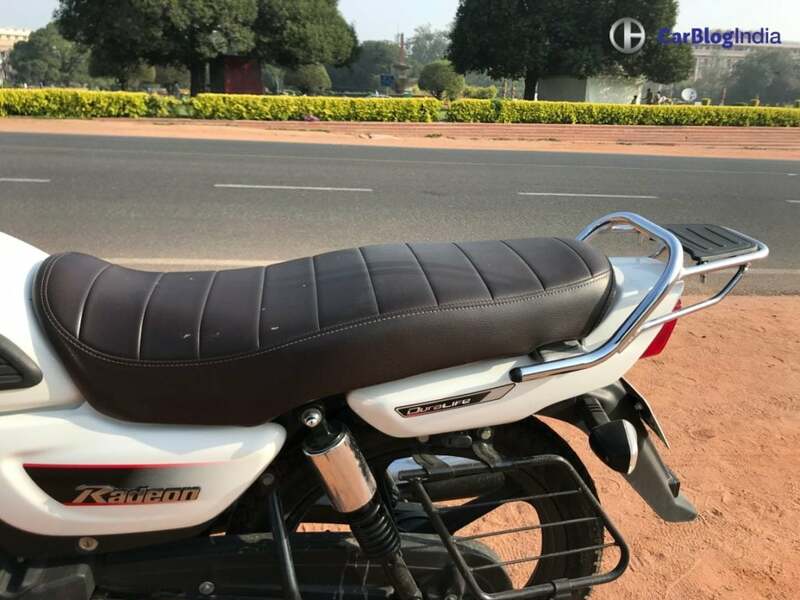 The tank pads on the side of the fuel tank, gold coloured engine, chrome border around the headlamps, LED DRLs, styling ‘TVS’ and ‘Radeon’ logos and the tan brown seat colour cover are some of the things that we liked. As said above, it is something out of the box despite having the regular design. 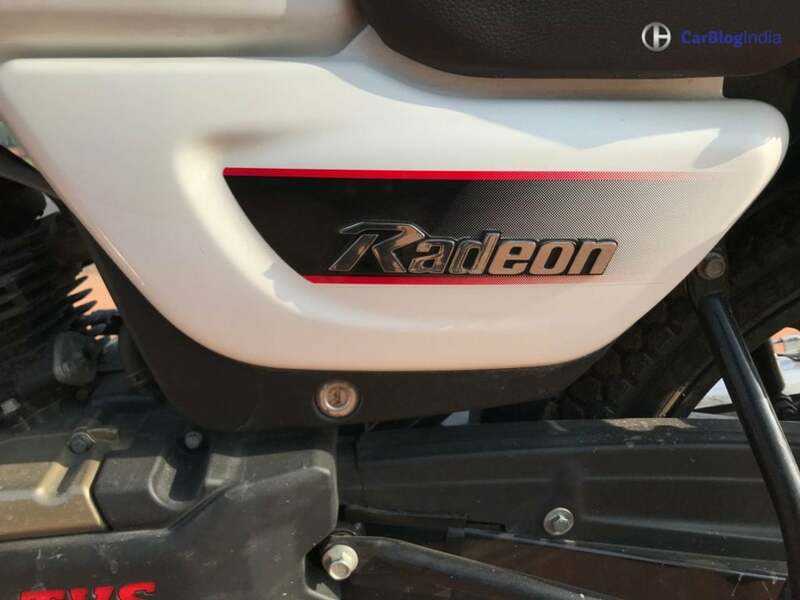 If I plan of a commuter motorcycle, I am sure to be confused between Radeon and Dream Yuga in terms of looks. 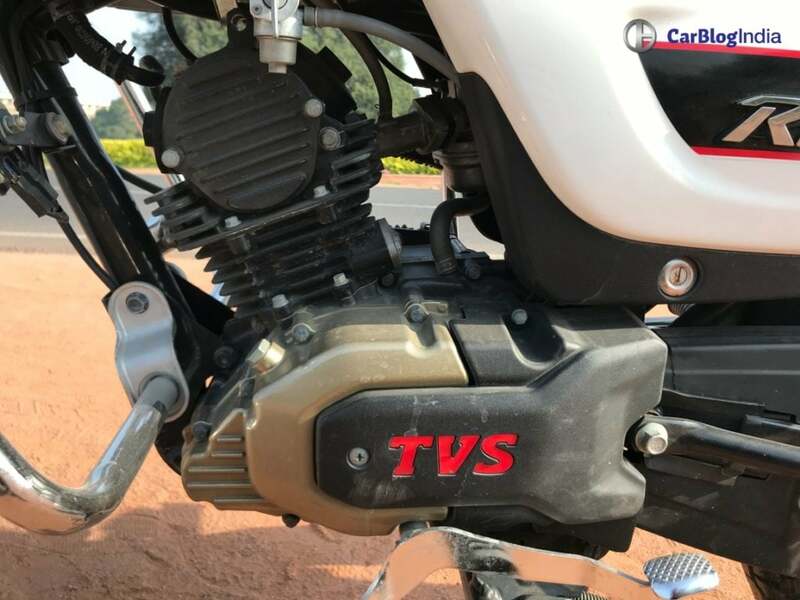 TVS Radeon uses a 109.7cc Duralife engine that delivers 8.3 BHP and 8.7 Nm of peak torque. The engine comes mated to a 4-speed transmission with heel and toe gear changer. 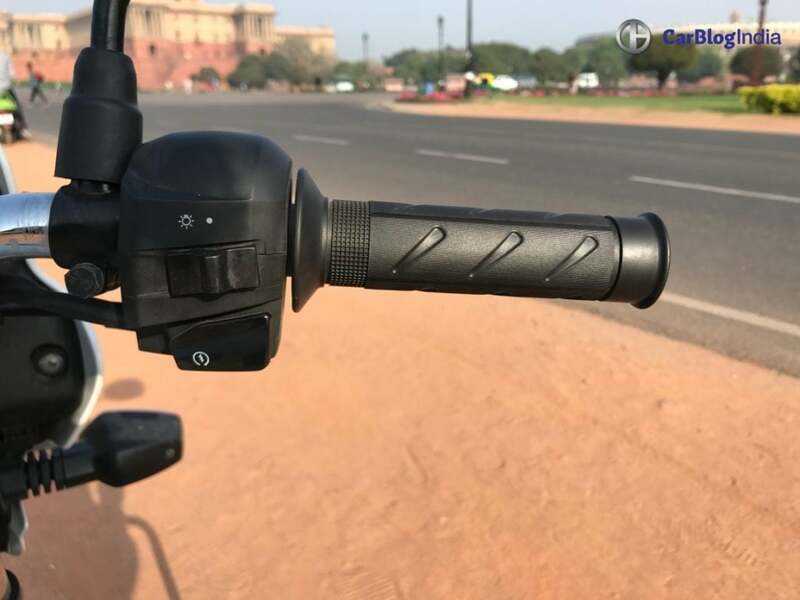 I must say, riding the regular 5-speed and 6-speed bikes got me a little fidgety here, as I kept pressing the gear pad below Neutral for the first gear. The engine here feels considerably peppy, taking no time to reach higher speeds. The really short gear ratios was quick to take me to 50-60 km/hr. However, at lower speeds, you have to shift the gear down otherwise it will stall badly. Radeon sits comfortably between 40-60 km/hr in its nature. Actually, even at 60 km/hr, it was comfortable cruising over long distances. The top speed achievable on this bike is 85 km/hr. I personally liked the engine refinement, which ensures that minimal vibrations come at regular speeds. If you take it above 60 km/hr, mild vibrations get in the handlebar and foot pegs, but is still considerable. Fuel economy is the most important point what attracts a commuter motorcycle buyers. Better the fuel economy, regardless of the design or the feature list, it attracts more people. So naturally, I had to focus on getting the mileage during different types of riding conditions. On an average, Radeon offered us a mileage of 72 kmpl, which is better than the claimed mileage of 69.3 kmpl. To achieve this figure, we kept the speed under 50 km/hr all time and ensured that there is no hard acceleration. Riding at higher speeds like above 60 km/hr and sudden acceleration will give you around 68 kmpl. 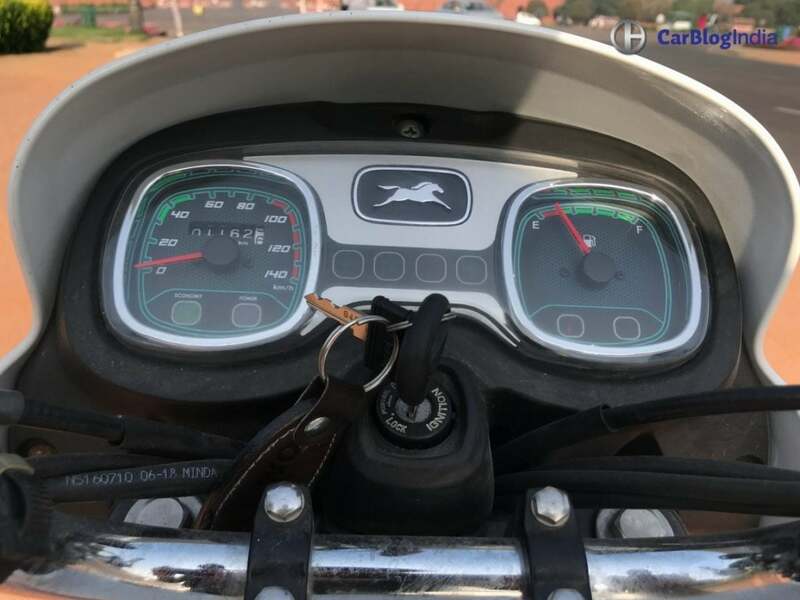 So, on a fuel tank capacity of 10 Litres, you can expect a riding range of nearly 700 kilometres. This range includes the reserve fuel capacity as well. Carrying a kerb weight of 112 kgs, it feels light and agile. Definitely, zipping through the traffic and overtaking should not be a problem over here. The thin 18-inch tires aid well in the handling of the bike. We found the grip of tires to be a bit tad. But, for your daily commuting, these tubeless tires are perfect. 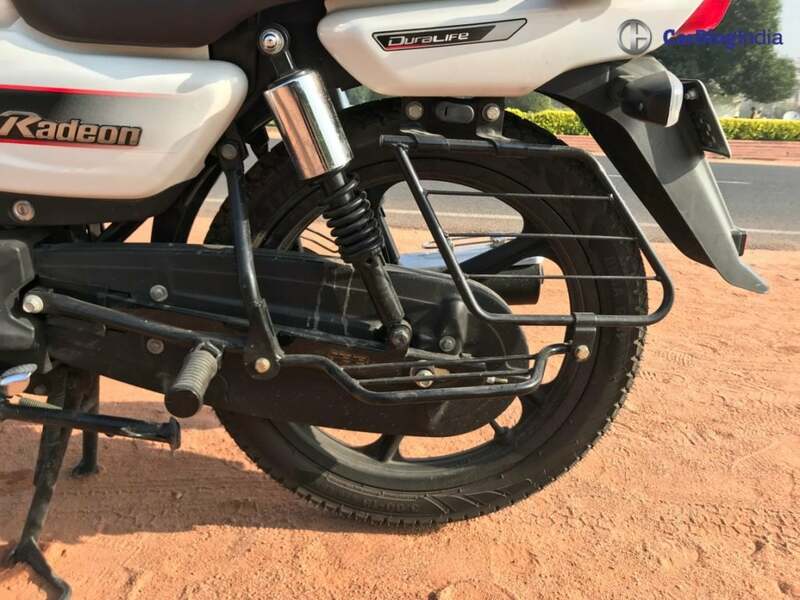 The handlebar is the typical one that you find in these type of bikes – single-piece raised bar which is very easy to reach. One thing we found unusual was the awfully firm suspension. It works fine over small potholes and mildly damaged roads, but God save my spine from large potholes. However, the suspension works well with the handling. TVS Radeon uses a well cushioned single long seat, which we found a bit too soft. As a result, riding over 1- 1 and a half hour did not make me and my derriere get tired. However, certain riders might still feel a numb bottom after extensive hours on the seat. 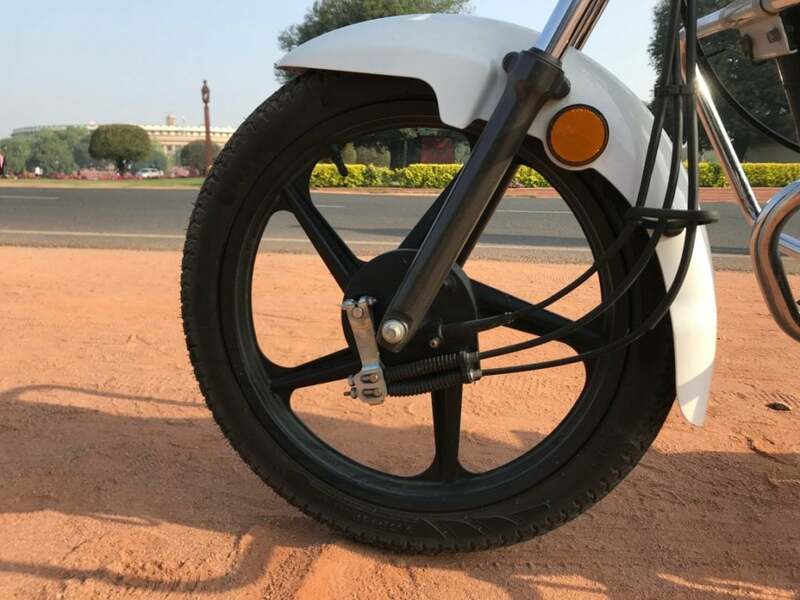 TVS Radeon uses a 130mm drum brake at the front and a 110mm drum brake at the back, paired with Combined Braking System. The bite of the brakes was not that good for emergency braking. We frankly expected an optional disc brake for a reduced braking distance. TVS can you help? The features list onboard Radeon is decent, comprising of a stylish dual pod analogue console, which shows the speed, fuel reading, an odometer and indicators for empty fuel tank, side stand and servicing. 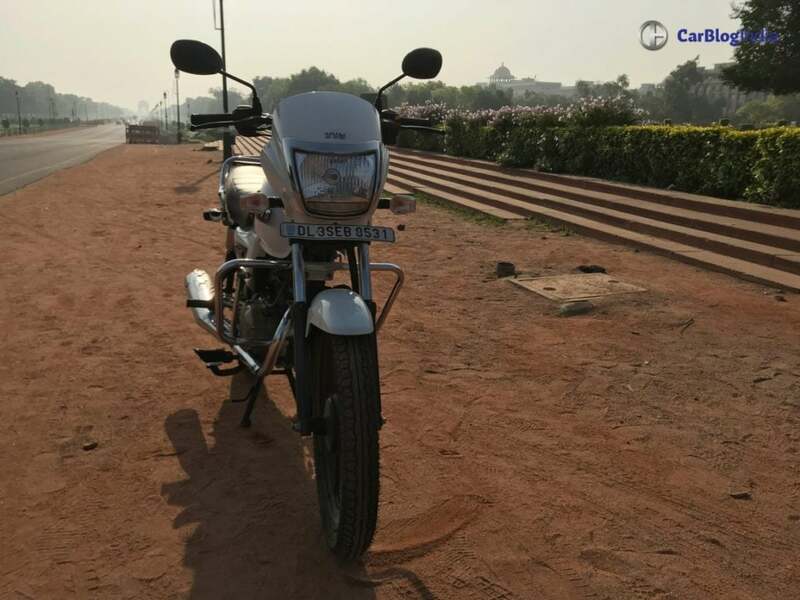 Other features include a cushioned seat, a small luggage rack at the back, luggage holder at the side of the seat, LED DRLs, blacked out alloy wheels and a tank pad. The reach of the headlamps was amazing at night. Even without the high-beam, it was working well. If you switch off the main lamps, you get LED lamps, which work fine, not that great. Of course. The side stand indicator is more irritating that my alarm clock. I usually have an habit of keeping the bike idle for 2 minutes before I start my first ride of the day. With this awful sound, that time is not at all possible. TVS Radeon goes for Rs 48,990 (ex-showroom), going against the likes of Hero Splendor Plus, Honda Dream Yuga and Bajaj Platina 110. 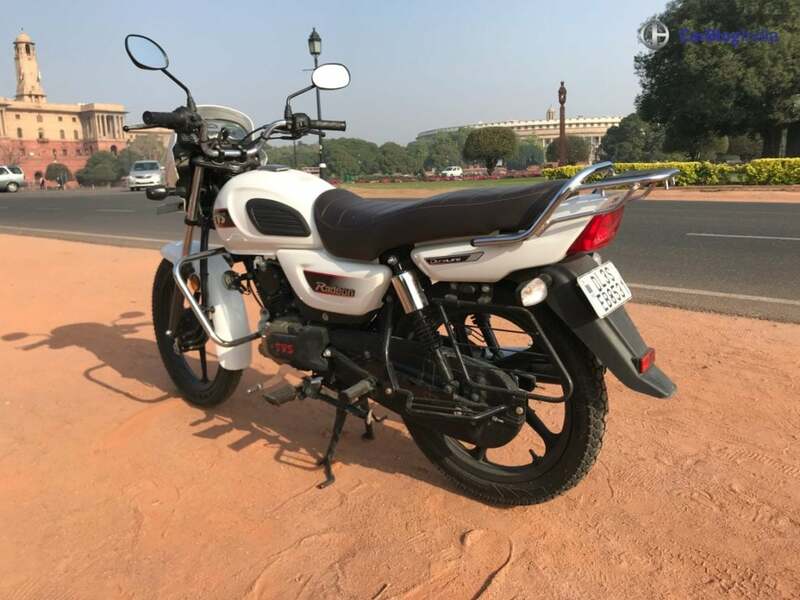 The 100-110cc space is very competitive in India, as these bikes go well under Rs 60,000. Radeon is a bike to watch out for in its class. Despite having an outdated design, it feels premium in a certain way. Amongst its rivals, Dream Yuga has some modern fits and finishes, but is certainly not an headturner. With a peppy engine, decent fuel economy and premium features, it can be a good buy for buyers who want something other than Splendor or Platina. These two bikes have not changed much in terms of looks over the years. Of course, we would like TVS to add or change some bits about the Radeon. That would mainly include the firm suspension and an optional disc brake.